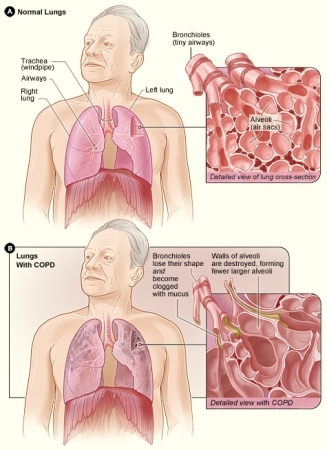 Sufferers of Chronic Obstructive Pulmonary Disease (C.O.P.D.) share their experiences of salt cave therapy. “I am a COPD sufferer and have had 10 sessions so far, I have certainly improved. Thanks to Jo and Lorraine”. Finally there is a salt cave in my home county of Warwickshire and I’m pleased to report it’s a very good one at that! I do suffer with respiratory issues and I had a handful of sessions at a salt cave down south a few years ago. It made a difference then but all the travelling was very time consuming so I stopped going. I am a firm believer in salt therapy and I will be making use of Little Himalaya for sure. After regular session of salt therapy (6 sessions each month) my breathed has eased. I very much recommend salt caves to anyone suffering with lung conditions. Before I started in struggled to walk from one room to another. Even after my first session I could sense a difference. I advcie anyone with COPD to try this out, and I will come again myself for sure. I would usually say that I have a bit of a rattily chest which is easily heared in my breathing. However after a few sessions this began to disappear. I’m a middleaged man who suffers with COPD. This affects day-to-day activities. I find it difficult to cough up phlegm. Salt therapy however changed all of this almost imeadiately. I begin to feel the mucus being loosend which would then cough up the following day. I then started to use my inhaler less and less. I very happy to say that this so far has proved a sucess. Everything has improvement. So glad I tried this. How incredible! I was told to try salt therapy to help my many conditions including, emphysema, COPD, asthma, allergies and many more. I take lots of different medications to try and help these conditions. After having sessions over two weeks I noticed that I would be coughing up a lot of mucus and I was breathing deeper. My airways had become clearer! Also, my stress levels had decreased a lot. I have not had a nebulizer or used Mucined since I started this process. My body has improved so much and I can breahte a lot better. I haven’t even has a sinus headache in over a whole week!! I am so amazed at these results that I have signed up for session for 5 months! I was visiting some family in the area and came across the Little Himalaya salt room. Having been a COPD sufferer for some time I thought it was worth a shot, so I called in and the lady on reception was extremely helpful in providing me with all the relevant information. There happened to be a session about to start so I decided to give it a go. I thoroughly enjoyed the experience and following it I did notice a slight improvement in my breathing. My nose was streaming all evening, although I was told beforehand that that can be a common side effect of the salt therapy. It’s too early to say whether it will be of any long term benefit- I would need to visit regularly but live too far away unfortunately- but it was certainly something a bit different and good value at £12. Six sessions at the Kenilworth salt cave seem to have had a positive impact on my COPD symptoms. I’ve tried every natural treatment and remedy in the book over the years and salt therapy is proving to be one of the more useful ones. I am hopeful that more sessions will reap an even more significant improvement.